Hello everyone! It’s been some time since the last major announcement, and we’ve got a couple of disconnected things to talk about, so I’m going to break it into two parts. First of all, we have two new team members to welcome: brekcut and Truedawn! Truedawn is a longtime Eternal Streamer who dates back to the closed beta days. He’s joining the ETS as a full time caster alongside Bairdrus, and will be lending his expertise to the ETS stream on Saturdays. He streams every weekday from 8AM until 2PM on his Twitch channel. Follow him on twitter @MoonFx541 or on Discord @MoonFx541. These two guys bring the core team up to nine members, plus Nightbot, who is rapidly become a core part of our team. You’ll be hearing a lot from Truedawn and reading a lot more edited by brekcut in the coming months. The last time we updated the RNG Eternal Patreon was back in December. Back then, the Eternal Tournament Series was just taking off, and we had JUST hired our first two article writers. A lot has changed since then, and we’ve discussed more reasonable goals for RNG Eternal. Additionally, our reward tiers were more or less useless – very few people actually sought the higher tier rewards. As such, we decided to restructure those as well. You can find the new goals in depth on the Patreon, but I will do a quick summary of why we chose the goals and rewards we did. We’re not exactly the kind of group that is set up to easily offer things like Deck Doctors and Coaching, so we’ve streamlined our rewards to be more in line with what people actually wanted. Most people supported us just to help us succeed, and we’d like to recognize that. At the $1 tier, we will continue to list all of our Patreon supports on the Supporters page (updated monthly). We really appreciate all of our fans and just showing us that you’re supporting us is a big help! At the $5 tier, you’re an ETS Supporter – a primary contributor who helps keep the ETS afloat and running smoothly. In recognition of this, we’d like to run your name alongside all our other ETS Supporters at the end of every ETS broadcast. While I anticipate this list will grow too long to reasonably read aloud, you guys are the ones that make this all (financially) possible and we’d really like to showcase your support. At the $20, you’re an ETS Sponsor – you’re supporting the prize pools and helping the ETS run major tournaments with serious prizes. As a sponsor, you get your name (or advertisement, if that’s your preference) on the between rounds page to show everyone who made this week’s broadcast possible. We’ve got a lot of goals that we’d really like to reach but don’t quite have the team or resources to pull off just yet. Still, most of them are well within reach. At the time of writing, our current Patreon is at $134, which pays for a staff of nine, website hosting, and prize pools. At $16 more, we can expand our article content to bring you true weekday content by adding additional columns on Tuesday and Thursday. In a perfect world, we’d have a tournament column and a draft column, but we’ll have to see what we end up with. At the $200 level, we’d like to run Sunday tournaments at least once a month outside the ETS. Not everyone can make it to the regular ETS timeslot and we’d like to include these players if at all possible. However, our production team can’t do most Sundays, which while not an impediment dissuades me from running tournaments without prize support. As such, its a Patreon goal to ensure that we get the prize support to run prized Sunday tournaments once per month. Much like the $200 level, the $250 level is about prizing. Players put a ton of time and effort into qualifying for major tournaments, and we’d like to make sure that its worth their while. A guaranteed prize pool would go a long way towards rewarding our successful players and making the tournaments more exciting for everyone. Our streaming network has had a fairly successful launch, and we think its something that people would like to see more of. At the $300 tier, we’ll expand our network to run seven days a week. You’ll be able to tune in every day and check out some great Eternal content! The $400 tier is the big one that everyone wants to reach. 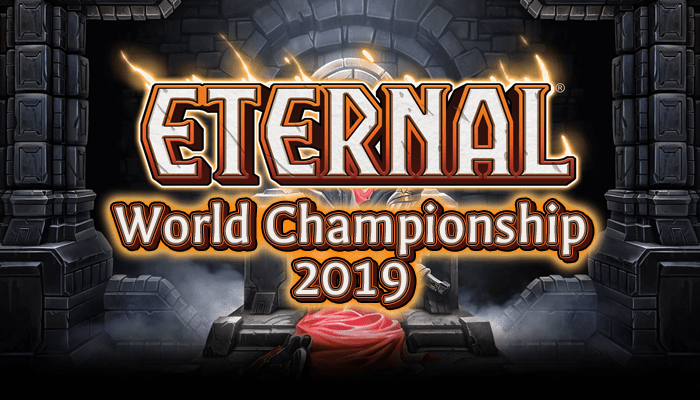 We’ll be able to get the RNG Eternal production team together and cover the World Championship live. Cameras! Desks! Formal apparel! It’s a very exciting goal but not currently feasible because we’re all scattered around the globe. If we can reach this level of funding, we can reasonably make it happen. At $500, we can move our long term plans into the short term – Site Migration. WordPress has been great to us, but we’d like a site where we can self-contain our entire tournament process, track stacks and reporting automatically with player logins, and integrate our Twitch and YouTube content directly. That’s something that’s going to take a lot of time and money to make happen, so we’re gonna need a lot of support. The $600 stretch goal is another long term plan. Should we reach this goal, we will gather and train a whole secondary production team. This will allow us to go a lot more in depth with our coverage, and a secondary stream at major events will help viewers see ALL the matches! We’d like to thank all our supporters, past, present, and future, for helping to make everything we do possible. Our Patreon goals are exactly that, goals, and should give you some idea of what we’d like to do in the next couple months. If you’re in a position to support us and would like to do so, you can accelerate our realization of those goals. If not, just keep supporting us anyways – we’ll get there eventually! Next Post: ETS Season 3 – Week 3: Stonescar Who?